Kurosaki Ichigo is not a regular 15 year old, because he has always had the ability to see spirits and ghosts. One day, a female Shinigami (God of Death) named Kuchiki Rukia appears before him, hunting for an evil spirit. But during the confrontation, the Shinigami's powers are transfered to Ichigo. Thus begins the adventures of Ichigo and Rukia and their mission to herd Hollows (fallen spirits). Hellsing Ultimate DVD Vol. 04-06 (Anime DVD) Japanese Ver. 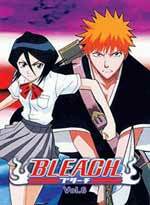 Bleach TV DVD Part 06 (eps. 96-107) - Japanese Ver.